Deriving its name from the Himalayan Goddess Shamla, a synonym of Kali, Shimla sits at an altitude of 2213 meters in the northwest Himalayas and is the present capital of Himachal Pradesh. Breathtaking Himalayan setting, clean air, cool climate and pine-scented breezes are nature’s contributions to Shimla’s charms. Rudyard Kipling, author of Kim, exclaimed "Allah! What a city!" after seeing the place for the first time. Ideal place to escape the heat and humidity of the plains, Shimla was the summer capital of the British India. Hence it is no surprise that you will find some fine specimens of British colonial architecture. However, today, if you want a sleepy colonial hill-station environment, Shimla is not that. Instead you can use the city Shimla as a useful starting point from which to explore a number of scenic hill resort getaways: Narkanda, Kufri, Fagu, Naldehra and Chadwick Falls. Shimla is also a base for visitors who come to seek adventure by taking resort to trekking, cycling and rock climbing. The majestic Viceregal Lodge, once the residence of the British viceroys, is the most prominent colonial attraction. 3.5km west of Scandal Point, the building has turned into a famous educational institute for multidisciplinary studies named the Indian Institute of Advanced Study. Located just off the Mall, the famous stroll-through destination in Shimla, the imposing Christ Church & St. Michael's Cathedral is one of the oldest churches in India. Built in 1885, this church is one of the most prominent landmarks of Shimla. As the name suggests, this marketplace is known for wooden toys located adjacent to the Ridge. 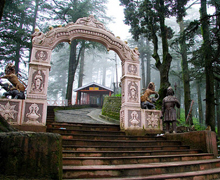 Located at an altitude of 2,445m, Jakhoo Hill is home to Shimla's most famous temple. 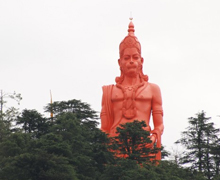 Dedicated to the monkey god Hanuman, the temple attracts visitors who come here to have a beautiful view of the Shimla town and its surroundings. On the way up to the Jakhoo Hill, the highest point in Shimla, you will find Rothney Castle, former home of t Allan Octavian Hume, the founder of the Indian National Congress. 15 kilometres from Shimla bus-stand, Tara Devi Temple offers a wonderful view of the surroundings. It is located on Tara Parvat at an elevation of 6,070 ft. Located west of Scandal Point, Himachal State Museum & Library is a repository of miniature paintings, coins and jewellery. The museum remains open on all days except Mondays and public holidays. 500m west of Scandal Point, the Kali Bari Mandir houses an idol of Kali. One can have a beautiful view of Shimla from the temple. Like many other hill stations in India established by the British, The Mall is the famous stroll-through destination in Shimla. Here you will feel the real vibe of Shimla. Here you will find the relics of the British Raj abound. 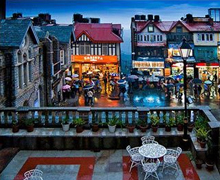 This promenade in Shimla is visited by the tourists and the locals for leisurely walks and shopping. 4.5 km from Shimla, Annandale is flanked by deodar trees forest and is home to an old shrine located on an edge. 7 km away from Shimla, the scenic spot of Chadwick Falls is famous site for the tourists who visit Shimla. Set amidst the dense pine forests, the place is also a sacred place thanks to its being home to old shrines that attract devotees. 13 km from Shimla, the scenic hill resort getaway of Kufri makes a wonderful holiday getaway in the mountain hills. Far from the crowd that throngs Shimla, Kufri is a blissfully secluded hill station that captivates those who long for unhurried pace of life. 13 Km from Shimla, Mashobra is surrounded by forests of oak and pine and is a favourite haunt of the picnickers. 3 Km further away from Mashobra, Craignano is a beautiful picnic spot with lawns and gardens. Located 22 km from Shimla, Naldehra Golf Club is set at 2,200 meters above sea level among mighty deodar cedars. Naldehra Golf opened its initial nine holes in 1905 and with the passage of time later added a second nine. Synonymous with tranquility, Fagu, 22 Km from Shimla, is a scenic spot amidst the surroundings of forests, ferns and apple orchards. Hotel Peach Blossom is the accommodation facility at Fagu. Situated on the Kalka- Shimla road, Kiarighat is endowed with stuning natural beauty in the form of incredible vistas of mountain scenery. Apple Cart Inn is accommodation facility at Kiarighat which is 23 Km from Shimla. 32 Km from Shimla, Theog is noted for the potato marketing centre for the state of Himachal Pradesh. Visited by the devotees for its an ancient temple, Darlaghat is 42 Km from Shimla. Hotel Baghal can be availed for accommodation. 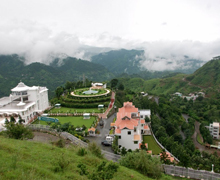 Home to the Himachal Agriculture and Forestry University, Solan is 48 Km from Shimla. Rock Rose is a fine resort providing accommodation facility at Solan. Renowned for its hot sulphur springs, Tattapani, located on the bank of Satluj, is 51 Km from Shimla. Nestled in a picturesque setting of green valley, Tattapani is high on the list of attractions in Himachal Pradesh. The water of the hot springs is high in sulphur contents which have therapeutic properties. 44 km from Shimla, Chail is nestled amidst towering deodar, conifer and pine forests and mist-soaked hills. Situated at a height of 2250 m on the spur of the Shivalik hills, this quaint hill town in the Solan district is a perfect destination for a weekend gateway. Chail’s claim to fame also lies in the fact that it is home to the highest cricket ground in the world. One can also find a polo ground. Located in the Solan district, Barog is home to the longest of the 103 tunnels that lie on the Shimla -Kalka narrow gauge. Flanked by oak and pine forests, Barog commands a picturesque setting. Hotel Pinewood offers accommodation facility at Barog, which is 55 Km from Shimla. 61 Km from Shimla on the Rajgarh –Solan Road, Uchghat is famous for Bon Monastery which houses a huge image of Lord Shenrab Mibo, founder of the Bon religion. Set at an altitude of 2700 mts, Narkanda is a famous popular skiing resort. 64 Km from Shimla, the place has Hotel Hatu which provides accommodation facility. Nestled at an elevation of 3647 m in the wooded forests of pine and oak trees, Kasauli, is loaded with attractions that have the potential of offering a visitor this cantonment town a mind-blowing experience. this hill station in the Solan district of Himachal Pradesh is 77 km from Shimla. 81 Km from Shimla is located the temple town of Bilaspur. Some 55 Km from Bilaspur is located the famous shrine of Naina Devi, one of the 51 shakti peethas in India. Hotel Tourist Inn Deotsidh is the accommodation facility at Bilaspur. 150 Km from Shimla is one of the most scenic lakes in Himachal Pradesh. Every year in November a week long fair is held at this sacred lake which is marked by folk dances and cultural programmes. The confines of Renuka wilife Sanctuary support a large number of wildlife including barking deer, black bear, goral, leopard, jackal, sambhar and spotted deer. Renuka is 335 Km from Delhi. The nearest rail heads are Ambala and Chandigarh which are 95 Km away. Buses and taxis are available for Renuka from Chandigarh and Dehradun. 226 Km from Shimla Paonta Sahib is an important pilgrim centre for the Sikhs. Situated on the banks of the Yamuna River, Paonta Sahib is 45 Km from Nahan. The nearest airport/railhead is Dehradun which is 44 Km away. Located close to Paonta Sahib are the ruins of Sirmuri Tal, which was once the ancient capital of a kingdom. 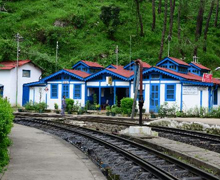 Rail: Shimla is connected by a narrow gauge railway line with Kalka (96 km) which in turn, is directly connected by rail to all the major places in India. Shimla is a 96 km journey on the narrow gauge toy train from Kalka. This train has been given UNESCO World Heritage status in 2008. Road: Shimla is connected by motorable roads with different places and cities some of the near cities and places connected with it are Chail (45 Km), Bilaspur (81 Km), Chandigarh (117 Km), Ambala (149 Km), Mandi (150 Km), Kullu (220 Km), Dehradun (240 Km), Manali (260 Km), Pathankot (358 Km) and Delhi (370 Km). Shimla brims with a large number of luxury hotels, budget hotels catering to the needs of everyone. Cecil, Asia the Dawn, Oberoi Wildflower Hall, Spring Fields, Wood Ville Palace Resorts, Ashiana Regency, Himland Hotel, Honeymoon Inn, Baljee's Regency Inn, Hotel Combermere, East Bourne Resorts and Moon International are the well known hotels in Shimla.